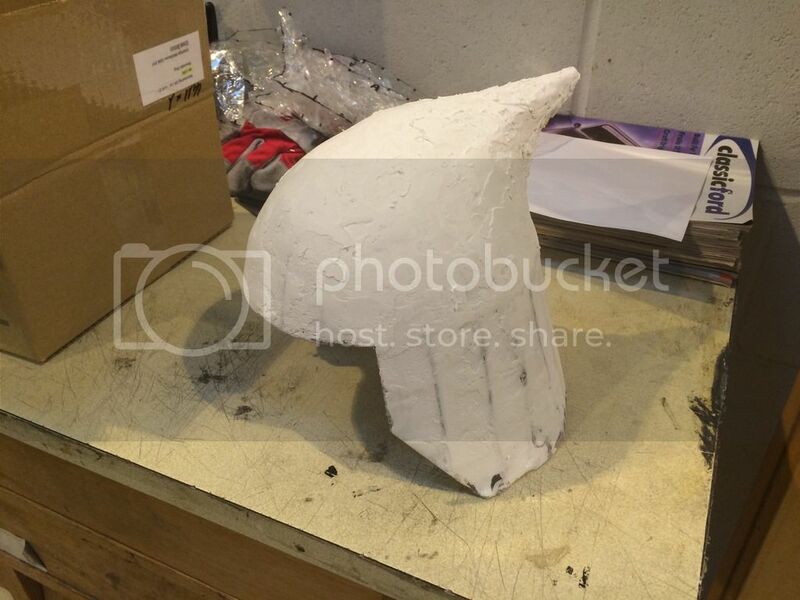 » copying a helmet with papier mache, help please. copying a helmet with papier mache, help please. Hi people, my first post here.....i have searched but didnt find exactly what i needed. so ive nearly finished a star wars helmet made with a papier mache base and then layered with wall filler to make the shape i needed. but what i need to do when it is done is make a copy of the helmet in papier mache again. can anybody please help with the best way to do this? i really struggle to get my head around things sometimes. Re: copying a helmet with papier mache, help please. You could go through the complicated process of making a mould (US mold) and then casting a papier mâché copy but it will be easier to use what you have made so far as an internal mould and layering on the outside of it. The result will be slightly bigger but not very much. First you need to think of a resist. Plastic wrap (clingfilm) will probably be best. You may need to use a smear of paste to make sure it holds to your original. Then lay torn pieces of damp newspaper over it, smearing the outside with paste. Six layers of paper over that, all pasted but not allowed to be wet (as opposed to damp)ought to be enough when fully dry. You can always add more over any weak spots, either on the outside or the inside. Is there any chance of a photo? Just a quick reply for now as at work, thanks for the replys people....gonna add the photo now and reply again later. Thanks. That's good and I note that you will understand UK spellings! It looks a nice construction, well shaped and strong. It is possible, with some flexibility in the piece you make by laying on the outside of the mould, that you will be able to get it off in one piece. Be prepared however, to cut off the neck protector and to re-attach it. Personally I don't think that will be necessary. Once off, you can add further reinforcement by layering on the inside. Check for fit and make any adjustments needed. So thanks for the advice.....ive still got to work with the shape of that a little and then i need smooth it within and inch of its life! :-) so are you saying i should pva the clingfilm to the original? Measure around the helmet from front to back (include the curve), and from side to side (also including the curve). Add about 4"/10cm to each total. Get a piece of cardboard and trim it to the +4" size. A box is fine, but open and flatten it. Approximately center the cardboard over the helmet so there will be some excess at all of the edges. Mark a 3"/8cm diameter circle with the drilled hole in the center (where a Jewish skull cap would go). A Sharpie or other felt-tip pen will be handy. Now, you want to fold and cross-fold the cardboard to force it to loose its flatness and stiffness. Fold it over the edge of a table, shift, fold, shift, fold, etc. Then turn crosswise and do the same thing. You want something like a piece of flexible cardboard felt. Center the cardboard over the existing helmet again, and drill a hole in the center of the 3" circle and down through the existing PM helmet. A small Philips-head (crosshead) screwdriver should work as a drill. If you have a bolt and nut and two metal washers, put a washer on the bolt, run it through both holes from the outside, add the other washer and then the nut, and finger-tighten it. Otherwise, run a stiff wire through both holes and bend it into a right angle on each side, to hold the cardboard in the right place. Either of these will be removed later. Do not cut into the 3" circle -- it is for stabilizing the rest of the work. I have found that the easiest way to cut this kind of cardboard is with a sturdy pair of scissors, or CAREFULLY with a single-edge razor blade. The softness of the cardboard wants to tear, rather than cut. Work slowly. Make a cut from the center forehead edge to the edge of the 3" circle. Make another cut from the back of the neck up to the circle. Then make a cut from each ear to the circle. Then cut midway between the four cuts to the circle, making a total of eight cuts. Save your cut-out pieces in the event that you need to do some patching. Beginning at the front again, make a mark with your Sharpie felt pen and cut through the center of each overlap to the 3" circle, remove the resulting two pieces of cardboard from each cut and tape the cut edges together smoothly as you go. You want to end up with a helmet that is just one layer thick. Work your way around the side, but leave the very back uncut -- if you have to make any 'adjustments', you can do it where it doesn't show as much. Repeat on the other side, beginning at the front again. If you've made any mistakes and have some gaps, use your saved cut-outs: trim to fill the area needed, and tape in place. When it looks right, trim around the edge of the existing helmet. Remove the bolt or wire that was holding the cardboard in place. Now, use your masking tape to cover all of the cuts INSIDE the helmet for more strength. Also, wrap pieces of tape completely around the edge of the new helmet to strengthen that edge. Papier mache over your new helmet and continue as you planned. *Having left a cardboard box in the rain for a couple of weeks, I noticed how pliable it was. And I thought how a thoroughly-soaked piece of cardboard could be fitted around a curved form (like a motorcycle helmet or some other waterproof object) could be a useful PM idea. You might not even have to cut it -- it might be soft enough that you could just tear small bits out gradually, nibbling away at it to reach the desired shape. A water-susceptible form could be encased in a plastic bag and thoroughly taped, and then have the damp cardboard molded around it. Of course, this would take some time to dry. Well, as you can see, you can be creative and use a variety of techniques. To answer your question - no, don't use PVA for your clingfilm. Just wallpaper paste or CMC will be fine so it can be removed easily if you want. Yes, Sue means what we in UK know as masking tape. For cardboard, cereal packets are good. For paper layering, newspaper is OK. Amazon uses two types of brown paper in their packaging. One is a sort of earth brown and quite absorbent; that is the best for our purposes. When you make the neck guard section, bring your paper or card all the way round, i.e. straight across from the two sides of the arc. This will help keep the shape in place until it is dried. You then just cut away to the shape of the guard.